Figuring out why people procrastinate is simple, it’s figuring out how to get over it that’s difficult. Overcoming procrastination is at the top of many people’s lists for bettering themselves. 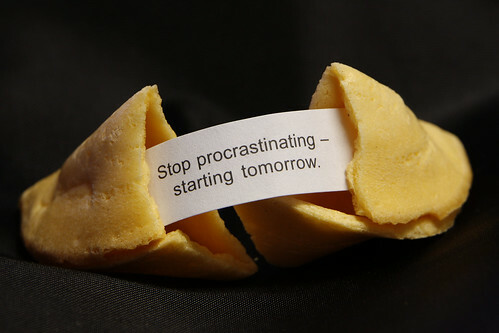 If you keep procrastination to a minimum you’ll lead a productive and efficient and likely happy life. Who wouldn’t want this for themselves? 1. Deal with Your Stress. Many people find themselves procrastinating because they lead stressful lives. You can solve many problems by dealing with your stress in a healthy way. Start getting enough sleep. Take plenty of time to relax. Ask for help when you need it. Find something that works for you. 2. Set a Schedule. It may help you to get a day planner or other type of scheduling plan. Not having a set schedule is one of the main reasons why people procrastinate. It’s easy to forget to do something, or to avoid doing something if you’re not holding yourself responsible at the end of the day. Look at your schedule throughout the day and make sure that you stick to it. * Another tip to remember is to set attainable goals for yourself. If you try to cram too much into one day, your body and mind will fight it with procrastination. Also, make sure you schedule in time for you to relax too. 3. Break your Tasks Apart. Sometimes you’ll find yourself procrastinating because the task at hand seems too large. An example would be cleaning out your garage. You may have boxes everywhere and just the thought of going in there is too daunting. In this situation you should tell yourself that you’re going to sort through one or two boxes per day. Before you know it the job will be done little by little. 4. Take Breaks. When you’re on the journey to overcoming procrastination, you must learn how to take breaks. If you push yourself too hard, you may eventually burn out. After you accomplish each small task, give yourself some time to yourself. Don’t be tempted to take breaks that are too long. If you are tempted then make sure that you time yourself. 5. Do It Now. When it comes to the little things, take on the “do it now” mentality. All those little things can add up to some serious stress if you continue to procrastinate. This just means if you get a bill in the mail, go online and pay it. If you find something out of place around the house, put it away. Stop allowing yourself to save things for later. 6. Give Yourself a Firm Deadline. When you have one particular task that you must accomplish, don’t leave anything up in the air. Give yourself a firm deadline that you must adhere to in the end. If you end up wasting time at the beginning, you’ll be hurting as the deadline approaches. If this happens to you, maybe that’ll be just the push you need to start staying on top of things. 7. Get Someone to Hold You Accountable. It’s easy to feel alone with your problems, but when it comes to overcoming procrastination there are probably many people that can offer you their assistance. Maybe you have a friend that also has a problem with procrastination and you can start to check up on each other. When you have a particular thing that you need to accomplish, have someone check up on you during certain intervals. It’s definitely a good way to hold yourself accountable in the end. Ever wondered how great successful people achieved great success? You can find the answer in The 77 Traits of Highly Successful People. Mark Foo has brought together 48 personal development bloggers and writers to co-author the success eBook that spells out all of the success secrets of the very successful people. This eBook is available to you FREE and you can grab your free copy now at http://www.77SuccessTraits.com. Don’t Forget To Follow PickTheBrain of Twitter!